Best Dog Food for Diarrhea: Buying Guide + Product Reviews! You’re looking down at your dog’s poo which is a runny mess and your little pooch has a sad, pained look on its face. It’s gross yet a fact of life if you’re a dog owner: dogs can experience diarrhea like us, humans. Breathe, relax, and plug your nose. 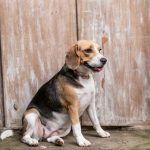 In this article, we will take a close look at the causes of diarrhea, how to bring back your pet’s stomach in order, as well as the best dog food for diarrhea. 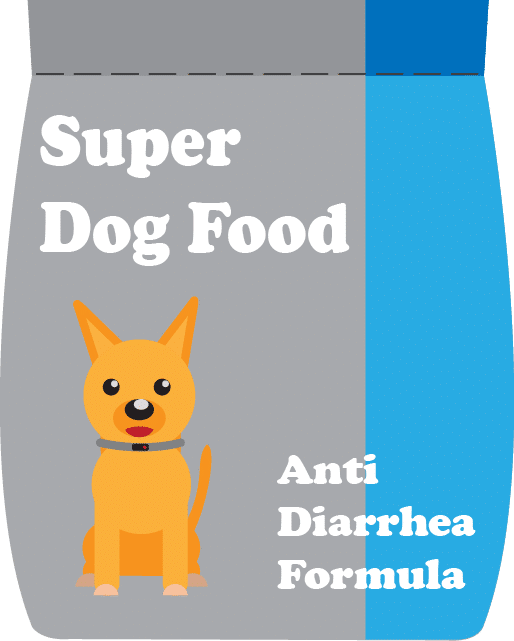 1 Best Dog Food for Diarrhea: Buying Guide + Product Reviews! Do you know what the normal poop of a dog looks like? A dog poop that’s healthy is solid but isn’t rock hard, is chocolate brown, log-shaped, and moist that it will squish when touched. If little Fido is sick with diarrhea, perform a visual analysis by the time you need to clean up its poop. Its appearance will help you and the vet determine what could be wrong. An orange or grey dog poop means organ trouble. As for black poop, it indicates a serious issue e.g. internal bleeding. Dog poop with white spots or bits can mean worms. If it’s watery or shapeless, then it could mean your dog has an intestinal problem. There are lots of steps you need to take to make sure your dog’s diarrhea is put under control. Let your dog fast for 12 to 24 hours. Fasting helps the digestive system of a dog rest and it will allow diarrhea’s cause to clear out. Of course, you need to give your dog water when it’s fasting temporarily from food. If possible, give your dog rice water during the 24-hour fast. Rice water is a result of boiling rice in water. It’s important that you only use high-quality white rice. Take note that minute rice doesn’t work at all. As for brown rice, we advise against it as it has lots of fiber in it. It won’t help make the stool firm as it speeds up digested material’s transit through the colon. Offer your pet a probiotic. Giving a dog probiotic will establish healthy bacteria within its gut and it will speed recovery. You will be able to purchase probiotics online as well as at your local vet clinic. We suggest you mix a probiotic into your dog’s water during its 12-24 hour fast. After the fast, give your pet simple and bland food. This is the last and most crucial step. You can’t continue to give your dog the food that it was eating before as that may be the culprit of its sickness. You have lots of options when it comes to anti diarrhea dog food. The best ones are those that will help a dog’s stool to firm up. You should take your dog to the vet if its diarrhea is bloody, severe or accompanied by fever or extreme weakness. The vet is the only person that can help you rule out serious medical issues. As you’re reading this article, we’re certain that you’re curious what dog food is best for dogs with diarrhea. We’ll get to that later. Let’s first tackle the characteristics of best dog food for diarrhea prone dogs. Some recipes improve their food’s digestibility using one to two ways, but you’ll find other products that incorporate many stomach-soothing strategies in their formula in order to help dogs attain the best possible results. 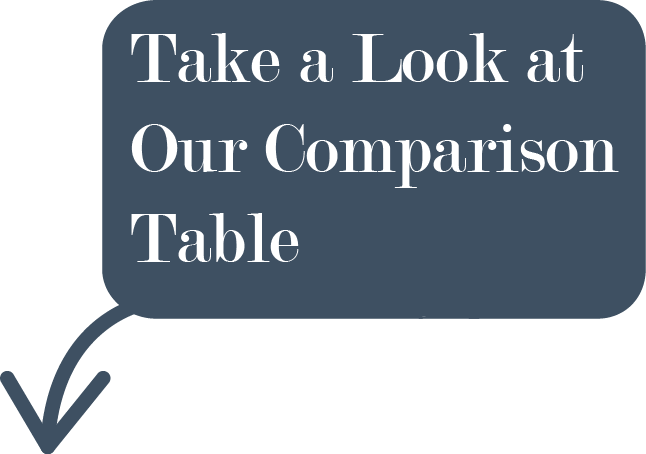 There are certain ingredients that are easier for our dogs to digest compared to others. Corn and wheat, for example, are hard for most dogs to digest as well as broccoli, cabbage, and other cruciferous vegetables. 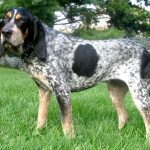 The ones that are easy on the digestive system of a dog and don’t produce any problems are carbohydrates such as sweet potatoes, potatoes, and oatmeal. For protein, salmon and lamb are good sources for diarrhea-prone dogs. Dogs may also benefit from ingredients that are indigestible like fiber. Fiber helps a dog’s stool to “bulk” and it also helps promote a smooth and orderly food passage through a dog’s intestinal tract. Pumpkin and whole grains are rich in fiber as well as fruits and leafy vegetables. Manufacturers of the best dog food for diarrhea incorporate food byproducts like beet pulp into dog food formulas in order to increase their fiber content. Fat is a necessary dietary component for your pooch and it makes food delicious as well. The problem with fat is that when it’s in excess, it can easily stress a dog’s stomach. Here’s the part you’ve been waiting for! Check the products that we can proudly recommend below. 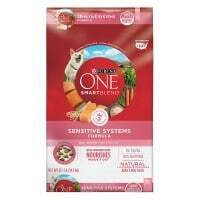 Purina ONE is one of the biggest names in the dog food industry. The SmartBlend is among the popular products from their line for plenty of reasons. While it’s advertised as a blend that’s for sensitive dog tummies, it’s not limited to only that. A strong dog tummy goes well with this formula as well. The primary key ingredient is salmon. It’s a rich source of protein and natural omega acids. This can help your dog heal faster and have better general health. The Purina ONE SmartBlend Natural also features ingredients that are rich with natural sources of glucosamine; which will then help with the joint health of your dog. 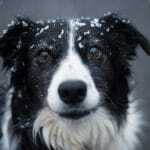 Keep in mind that most dogs suffer from joint problems during their senior years. If you only start taking care of this issue at that time, then it will be too late. It’s best that you start early when it comes to preventing joint problems. Joint problems in dogs are a serious issue. Unlike humans, we know that getting exercise is crucial for our health. On the other hand, dogs with joint problems will stop moving. 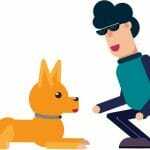 Because of the lack of exercise, the dog’s health will deteriorate at a faster pace. Obviously, you don’t want that to happen to your beloved pet. If there’s one downside with the Purina ONE SmartBlend, then it has to be the primary ingredient. Salmon is a hit-or-miss for dogs. Some dogs will chow it down mercilessly, while others won’t even touch it. While it’s normal for humans to consume grains, it’s not part of a “normal” diet for dogs. Keep in mind that dogs evolved to eat meat. As humans, we tend to feed the pet with what we eat. And, feeding grains or dog food with grains to the furry pet is “normal” for some people. To put it bluntly, this is not normal. At worst, it could cause serious troubles with the stomach. 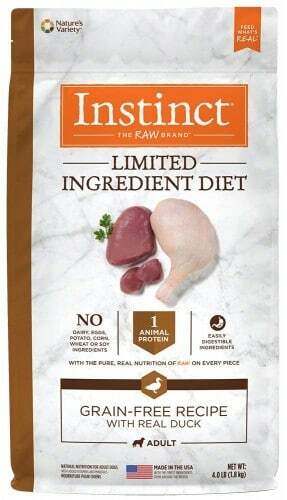 You can avoid all that with the Instinct Limited Ingredient Diet as it consists of zero grains. The main ingredient is cage-free ducks. Having a cage-free label adds a lot of positives to the formula. Ducks that are caged in tight spaces are unable to move. When that happens, the duck’s meat will develop abnormalities. You don’t want your dog to consume this kind of meat. On the downside, some dogs are allergic to poultry. 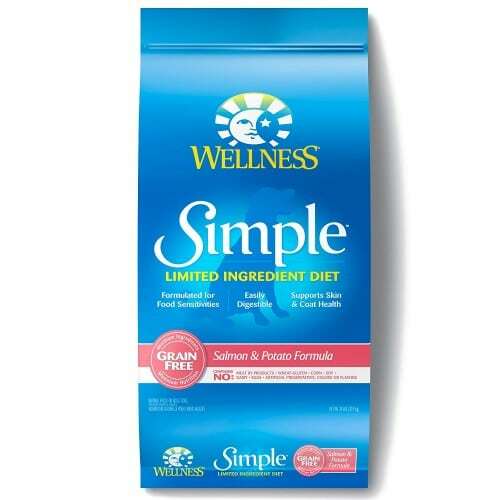 Hence, you need to be observant for the signs in case you feed your dog with this formula. 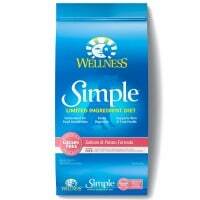 Wellness Simple Natural Limited Ingredient has created a formula for sensitive dogs. The goal was to minimize problems by limiting the ingredients. With this specific formula, the main ingredients are salmon and potato. With such a combination, you’re guaranteed to get excellent protein sources with a bit of carbohydrate. It’s a good mix for a balanced diet. The formula also doesn’t contain any gluten or wheat, which are one of the most common causes of digestion-related problems for dogs. Having no artificial additives and coloring is also a plus. On the downside, the mix of salmon and potato is rather uncommon. Hence, some people find it to have an offensive odor. If that doesn’t concern you and the diet of your dog has a higher priority, then this shouldn’t be a problem. Hill’s Science Diet Adult Sensitive mainly contains chicken meat. The formula is specifically geared not only for sensitive tummies but also for sensitive skin. 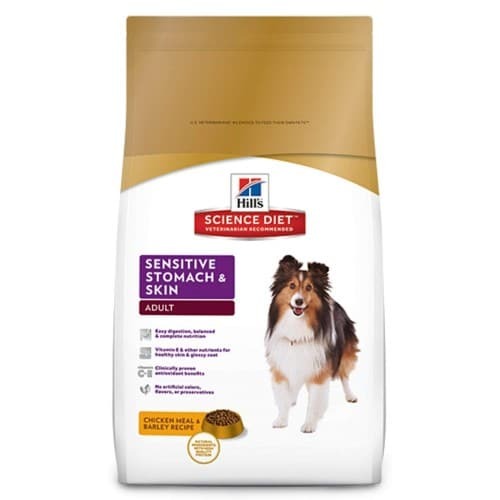 Not a lot of people know that the dog’s diet plays an essential role in the health of the skin. In most cases, what the dog eats will reflect in the dog’s skin and coat. If something isn’t right with the food, the dog will start itching. When that happens, it all goes downhill from there. Your dog will start scratching relentlessly, which will then cause open wounds that invite a truckload of other problems. Also, the coat of your dog will look unhealthy and terrible. When talking about possible downsides, the Hill’s Science Diet Adult Sensitive becomes ironic. This is because some dogs are allergic to chicken. If your dog is allergic to poultry, then even if the formula is carefully and meticulously prepared, the itching will still happen. Having said that, just as long your dog is not allergic to poultry, you can expect the gut, skin, coat and overall health to improve. 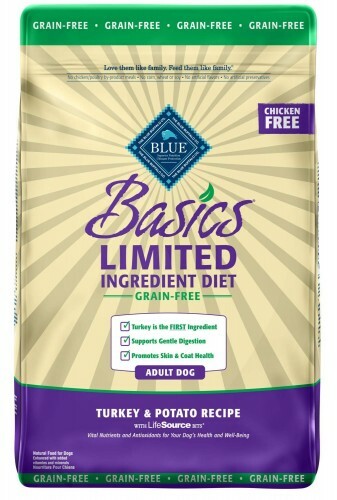 The primary ingredient of the Blue Buffalo Basics Limited Ingredient is turkey meat. Then, it’s complemented with potatoes. The formula offers high protein content and a bit of carbohydrate for your dog. Keep in mind that your dog will need both at the right amount. With this formula, there’s no need to do measuring as it’s already done for you. The excellent thing about the formula is that it promotes gentle digestion. As a result, your dog is less likely to suffer from indigestion or other gut-related issues. The company also guarantees that the formula doesn’t contain any beef, chicken or other meat sources aside from turkey. This will limit the chances of allergic reactions. The formula consists of other smaller ingredients that are good sources of vitamins, minerals, and anti-oxidants. Such additions will help improve the overall health of your dog. On the downside, the kibble is a bit hard when compared to other similar products. This is probably the result of the turkey and potato mixture. However, this is more of a preference issue for your dog. Some dogs love something that they can sink their teeth in to, while others want something on the softer side.